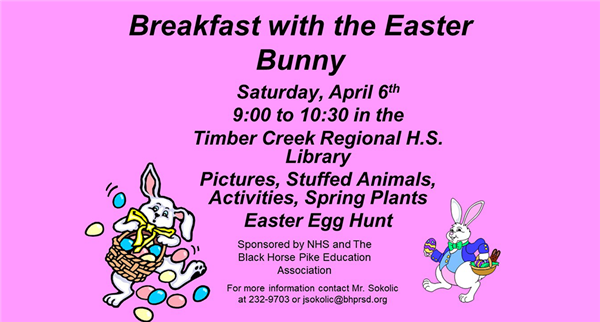 On Saturday, April 6, the NHS and Black Horse Pike Education Association will host a Breakfast with the Easter Bunny event at the Timber Creek Regional High School library from 9 to 10:30 a.m. The morning will feature pictures, stuffed animals, spring plants, activities and an Easter Egg Hunt. For more information, contact Mr. Sokolic at (856) 232–9703 or jsokolic@bhprsd.org.